Price is right, revolvers work. Cannot go wrong with a conceal carry revolver. I choose these items for their quality and price. They were also ordered for a specific customer who liked the style of the firearm and ammunition. For home protection and to conceal. My son said this is a perfect gun for a female to carry. Been looking for a gun for my wife and found this one at a great price!! Good price on quality firearms. Nothing more reliable than a Smith snubnose. Great price. Easy process. Thanks!!! Excellent weapon for concealment at a great price. I wanted something not too complicated for my wife for her first gun. Easy concealment, and always wanted to own this 38 special. Love S&W...order because it's air weight, conceal carry and 38 gets the job done! Simple and easy to use conceal carry. 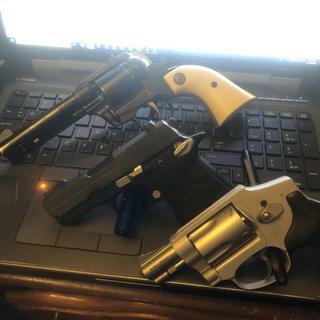 Liked the style for ccw and have always liked S&W revolvers. Good price was icing on the cake. I picked Grabagun because I couldn't beat the price locally. Great price for a Christmas present for my wife. My father has wanted one for a long time. The price was too good to pass up so it will be a Christmas present for him. As a retired 30 year Deputy Sheriff ('67 to '97) he never made the transition to automatics and carried a revolver until the day he retired and it's still his preference. Great conceled carry revolver. Can't beat a Smith. is there a lock on this firearm? BEST ANSWER: There is a key lock for deactivating the firearm (around kids for example). Only safety when unlocked is your finger. There should be an integreal lock with a key included by Smith & Wesson. The revolver itself has no safety...you just pull the trigger to cause the firearm to discharge. It’s a very popular, compact and dependable firearm. Yes, it comes with an internal lock. Yes, mine has the lock. 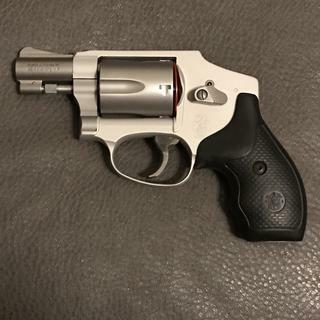 smith and Wesson 642 airweight centennial stainless .38 SPL/P 1.85 -inch 5 RD. Is this high pressure barrel ? 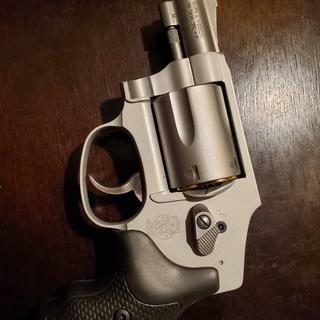 BEST ANSWER: Smith & Wesson rates this revolver as able to handle continuous loads of .38 + P ammo (over standard pressure loads but below maximum test loads). Therefore one would assume it (the barrel) would withstand higher pressure loads than a non + P rated recolver’s barrel would. For more details contact S&W Customer Service. If the question is with respect to +P ammunition the answer is yes according to the information stamped on the barrel.There is no reference to "high pressure". You may call S&W customer service for further information. It can handle +P rounds, if that is what you’re asking. It is rated for +P ammunition. Perfect gun for my girlfriend to conceal carry. Sticks it in her purse and off she goes. All she has to do is aim and shoot. It's perfect. I would reccomend this item for sure! such a sweet little snub. 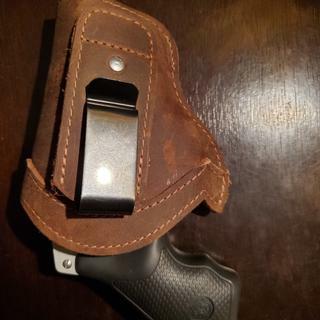 I pocket carry in a holster of course can't even feel it so light. 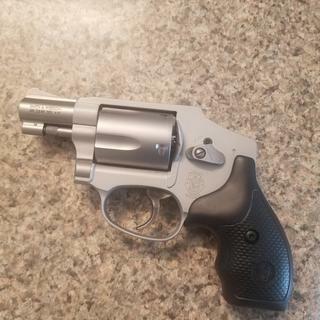 This is my first revolver but it wont be my last. Your service is outstanding and the prices are very reasonable if not a little better that a lot of others. This was the first time I had used Grabagun and it was a great experience. Would definitely recommend them if you are in the market for a gun! can’t beat it for the money, bought 4 for 265.00 each after the 50.00 rebate from S&Wand gave them for Christmas presents. Very light in weight, haven't taken it to the range yet but will soon. This will most definitely be my summer CC weapon for the summer. Very impressed with shipping right before Christmas.. Every time i have ordered from Grab a Gun .. Very Very Pleased..
Love it.. couldn't be Happier.. Great price.. and Unbelievable shipping before Christmas..
Great little pocket gun. Not a range shooter it hurts when you shoot it. Should be a good gun for up close and personal if someone is attacking you to save your life but not one to enjoy at the range. the gun is Great. not happy with the FFL i used (m&m guns in st peters) as they have dubbled there fee without notiss (now $50.00). I must say that it was unbelievable how well put together your web site is and the huge selection of good prices. ordered this at 5:30 EST AND had all the paper work,registering and all the pains that New York puts one through in my possession 21 hours after you shipped it. great!!!!! Excellent pistol, very light, and its a S&W. Fast and courteous service.Staff very helpful as this was my first online firearm purchase. The price even after paying my local firearm dealer to do the paper was better than I found locally.I recommend Grabagun and will use again. The revolver is perfect for exactly what it was made for. Close defense and easy to carry. 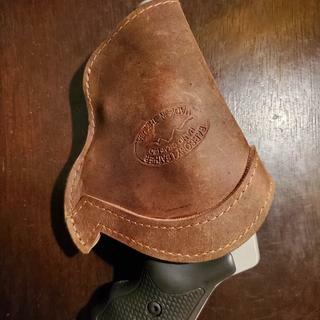 Looks nice, feels nice, and is a quality built product by S&W. Enjoying my Smith & Wesson 642 Airweight Cenntennial Stainless.38 SLP/P!! Makes a great pocket pistol. Thank you GrabaGun for your great prices and excellent service. Will definitely buy another gun in the near future. Amazingly accurate for a small double action. Crimson trace make it perfect. the 642 is a great small revolver a short range revolver for sure with a large recoil with defence ammo but it is for short range. Thanks grab a gun for a great pistol and great price.If I need a new firearm I will surely check with you again. Love this 642. Lite shoots straight. So easygoing carrie. Thanks grab a gun for a great pistol and great price.If I need a new firearm I will surely check with you again. Nice handgun and functions well with the exception of a difficult and gritty trigger pull, ever for a S&W. Perfect purse or concealed carry gun. With the hidden hammer nothing in a purse or pocket can block the action. point and shoot. Reliable ALL the time. I have given several of these as gifts to family members. Powerful pocket gun. Light as a feather. This works wonderful with a clipdraw and gym shorts. Just tie a slip knot in your drawstring of your gym shorts and with a clip draw on the pistol it will stay in place. It barely prints and will not move even if you run 5 miles, do burpees, push-ups, sit-ups or all of the above. Great service, fast shipping and great prices. That’s grabagun. Was looking for light weight carry, long distance drives,Fits the bill, Airweight,and 38 spl ,cartridge with some power. This piece is an excellent very light carry piece and will never rust. I put a set of Desantis Clip Grips on and made the fit even better. Perfect back-up gun. Factory trigger pull can be dropped from 14 lbs to 7 lbs with an Apex spring kit. Easy install, makes it smooth and easy. Great purchase!!!! Paid for right before closing thursday had it tuesday afternoon!!! Great quality great service!!!!! This Smith & Wesson small frame .38 Special is a top of the line Pro series upgraded version of a well-known standard design which will be familiar to most gun owners, the all-business snub nose lightweight revolver with easy portability and top of the line style. If youre looking for top quality, high performance and precision quality the Smith & Wesson .38 642 Pro is exactly what you want.